Most residential customers have only a vague perception of the landscape they would like to have surrounding their home. They may have seen a photo in a magazine or a neighbor’s yard they admire. 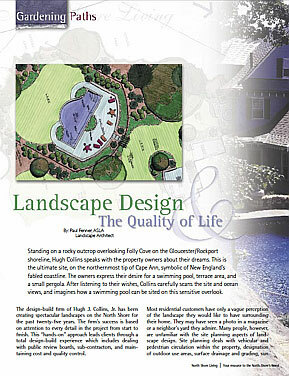 Many people, however, are unfamiliar with the site planning aspects of landscape design. Site planning deals with vehicular and pedestrian circulation within the property, designation of outdoor use areas, surface drainage and grading, sun and wind orientation, views, and so on. The benefit of good site planning is to unify these important variables while creating convenience, accessibility, safety and security. Put a pull quote in this spot to help break up the sea of text. It can be excerpted from the existing text, or a special note added to bring the info up to date. Landscape design deals with the more detailed components of a project such as retaining walls, surface paving, structures, fencing, outdoor lighting and planting. Good landscape design appeals to the senses in the form of attractiveness, curb appeal, privacy, charm, comfort, and general well-being. Together, site planning and landscape design combine to provide a sense of place and identity that is unique to the property and reflects the family’s lifestyle. With new home construction, site planning and landscape design are fully coordinated with the architect. Performing a site reconnaissance early in the design process will often influence design and placement of the house. This is an important step that results in optimum use of the site, and avoids costly redesign or remedial work later. A well designed landscape adds to the enjoyment and use of outdoor spaces while increasing the overall value of the property. The enormous growth of nurseries and garden centers during the past decade attests to the increased interest in residential landscaping. The benefit of good site planning is to unify these important variables while creating convenience, accessibility, safety and security.